school, and although this is a work in progress for our youngest children, it is our job to help guide them in learning these rules. We use positive reinforcement and encouragement to help them make good choices. We will be in communication with you if your child is struggling to meet one of our expectations. This system gives children the insight on how to manage their behavior. It encourages positive behavior and for children to become mindful that their behavior and choices are up to them. We remind the children constantly that they always have choices. 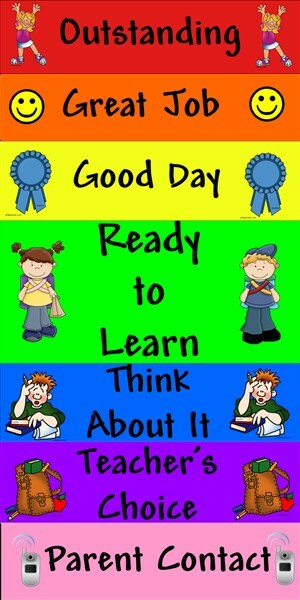 Every day your child starts on, “Ready to Learn.” Your child’s clip will go up on down depending on the choices they make and the behavior they exhibit. Additionally, your child has the opportunity to go “Off the Chart” onto THE TEACHERS. If your child exceeds and surpasses daily expectations for the day, her/his clip goes to Ms. House I will email you and your child is acknowledged. I offer celebratory stickers to the children as well. Therefore, at the end of the day when you pick up your child, please take a look at the clip chart and discuss them with your child. Often times it’s challenging to have a discussion with your child’s teacher while in the classroom because they are busy taking care of the children. However, I will be more than happy to set time aside so you and your child’s teachers can further discuss your concerns regarding your child’s behavior. Please do not hesitate to let me know.